Next week is Tech Week for Seattle Opera's production of Attila, when the company moves into McCaw Hall and one by one adds all the elements of production: the set, titles, orchestra, costumes, hair and make-up, lights, and finally the audience. 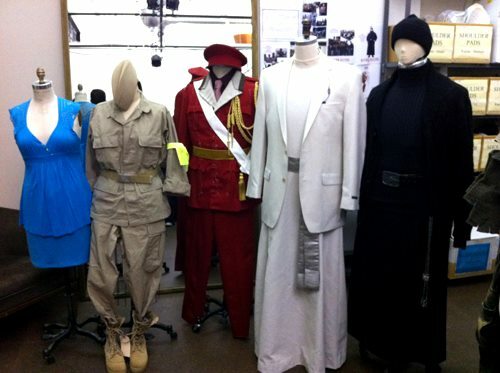 So this week, at the Costume Shop, they're putting finishing touches on the costumes to get them ready for the stage and the lights. With the contemporary look Melanie Taylor Burgess has designed for Attila, finishing touches includes the curious process known as "distressing" the costumes. The chain hanging from the pocket of this camouflage jacket is typical of the tools used by Jeanna Gomez, the artist responsible for distressing this piece; the heavy weight stretches the garment, bringing out the natural folds and wrinkles, and Jeanna then paints highlights onto the cloth, darkening the parts that get buried and brightening the spots where the lights will hit. Stage light has a tendency to make everything look flat; the painting we're doing here, like stage make-up, fights that tendency, giving the pieces even more depth then they'd have in real life. When you buy new clothes off the rack, you want them to look flat and clean and spanking new. Distressing is the artful way of ruining that nice new look. That way, the same costume piece will get distressed again and again--and the audience can see the process! I'm pretty impressed by how these costumes are neatly done. I might visit this shop soon.